“I am a retired geotechnical engineer and have been a member of the Club since 1983. I restored two cars from scrap, both 1933 models: a Super 8 roadster (I sold to the Elbourne family some years ago) and a Gloria Ten saloon bodied by Ruskins of Melbourne with the twin carburettor engine. The Gloria has been rallied since 2006 when I completed the restoration and it has now covered over 7,000 miles without any major problems. Every time my wife Jenny and I take it out, it covers at least 50 miles on a run and this may increase to hundreds for a weekend event. 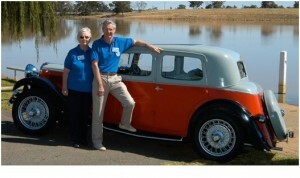 An article on our car was published in Triumph World issue 126, June/July 2012, P. 78-79. The spare parts from the Club were an absolute boon during restorations and I cannot go without mentioning the wonderful assistance I had from the late Ian Harper. I am very happy to be able to assist in Australia and keep the flag flying with the small band of members we have that are spread far and wide in nearly every State. If there is anyone we can encourage and assist we are always available and amongst us we do have a few second hand spares carefully collected over many decades. The full story of Pre 1940 Triumphs in Australia can be found in our book that is still available form me : John Shepherd and Jon Elbourne – Triumph Cars in Australia 1924-1939 (2007), 136p.